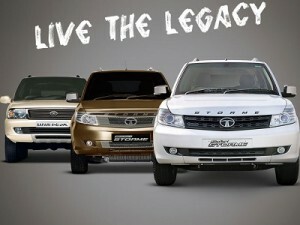 Tata Motors has launched the grand new edition of Safari Storme Sports Utility Vehicle in the Indian market. A number of spy images of the new Safari were revealed over web in the past and Indian buyers have been waiting for the official debut of the same from past one year. With all the exclusive additions and modifications, the new Safari Storme Facelift is priced for Rs. 9.99 lakhs in the domestic market. 2015 Safari Storme Facelift comes with the honey comb patterned front grille that has been adopted from Land Rover. The exclusive Tata logo accompanies the STORME emblem on the front grille. The manufacturer has also updated the projector head lights and added round shaped fog lights at the bottom. The measurements of the model have not been altered at all but the new edition offers ground clearance of around 200 mm which is perfect for Indian driving conditions. The manufacturer is offering five vivid colour options of the brand new Safari Storme and they are Astern Black, Arctic White, Arctic Silver, Pearl White and Urban Bronze respectively. The new Safari comes powered with a 2.2 litre turbo charged VARICOR diesel engine that is capable of producing around 150 PS power at the peak along with 320 Nm of torque. Engine comes mated to a five speed manual transmission gear box along with 260 mm self adjusting clutch. The capacity of the fuel tank has been increased to 63 litres from 55 litres of the earlier version. As per the information, the new Safari Storme assures around 14.1 kmpl mileage on an average. The SUV is being offered in four trims in India and the base variant is five seated model whereas the remaining three trims are seven seated. Some of the exclusive features of the new Safari Storme includes automatic climate control and the ‘inertia’ switch which stops fuel supply to engine, turns on the hazard lights and opens all doors in case of emergency.